politicalbetting.com » Blog Archive » What’ll May 5th do to Nick’s and Edward’s careers? 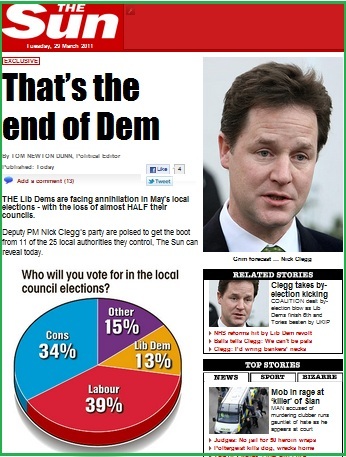 « Andy Cooke asks: Where have the Lib Dem voters gone? What’ll May 5th do to Nick’s and Edward’s careers? Are the locals set to underpin the Labour leader? Yesterday morning I was accused of seeking “to manage expectation” when I speculated that Labour could be heading for a gain of 1000 or more seats in the local elections in England on May 5th. The poster, who clearly has close links with the party, said that “the last time he looked Labour was expecting gains of about 200”. Well if that is the case then Labour has a huge expectation management challenge following the publication in the Sun of a YouGov poll on the May 5th locals in England. The poll was analysed by Professor Colin Rallings, from the University of Plymouth’s Elections Centre who estimated yellow losses at 700 seats with the blues losing 1,000. This is how the poll came out with comparisons on what happened in these seats in 2007 – CON 34%(-4): LAB 38%(+16): LD 13%(-11), OTH 15%. So a massive boost for red team. So if the poll and the projection are correct Labour and Edward are heading for a massive result on May 5th which will, surely, put an end to all the leadership speculation. The great thing for Labour is that they start at such a low point – defending just 17% of the seats being contested. The only problem with today’s numbers is that they might raise expectations so the actual outcome could be seen as a failue. For Nick Clegg, of course, losses on the scale projected would be damaging – particularly if on the same day the AV referendum produces a NO. On the other hand I can see his team quite welcoming the poll – simply because it will lower expectations even more. If the yellows end up only 500 seats down it could be described as a success. I am trying to persuade one of the bookmakers to put up a local election seats market – so farl without success.